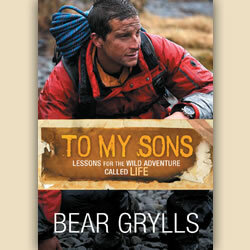 Book Spotlight: "To My Sons"
Popular star of TV’s “Man vs. Wild,” adventurer Bear Grylls has now published the witty and wonderful gift book To My Sons, which communicates the wisdom gleaned during his exciting life. As a mountain climber, world-record holder and former soldier in the British Special Forces, Grylls is no stranger to adventure. Through quotes, scripture verses and his own reflections, this loving father of three boys offers counsel about the risks, tumbles and victories of a life fully lived. Renowned UK-based sketch artist Charlie Mackesy provides entertaining cartoons throughout this poignant primer. Also recently published is Never Stop Holding Hands and Other Marriage Survival Tips, written by Bear’s wife Shara, who offers encouraging wisdom of her own on surviving the grand adventure that is marriage. Whether married for 50 years or just newlyweds, any couple will appreciate Shara’s lighthearted reminders of how spouses can keep the love and friendship alive.